Dell U2410 is a great monitor in 24 inches, with vivid color, convenient UI. When using it with my Macbook Pro, I found it too bright and the default color setting is not so good. I adjusted the color in comparison of MacBook Pro's own LCD. And here is the Dell U2410 ColorSync Profile for MacBook Pro. Follow the steps below you may feel better with your U2410's color. Download and unzip the file to /Library/ColorSync/Profiles/Displays (change the unzipped filename if you want). Go to System Preferences -> Displays. In Dell U2410 window, choose "Color" tab, you may find "Dell U2410 (tkjune)" in the left list. Click it. The color of your monitor should now change. Is that okay? If not, you still have to "Calibrate..." by yourself. Don't worry it's quite easy with the guide of Apple Display Calibrator Assistant. Only that you may have to do it several times to find out your favorite mode. Tips for you: Open same application window, same photo in both monitors and calibrate step by step. To make the U2410's color exact same with MacBook Pro's LCD, you win. 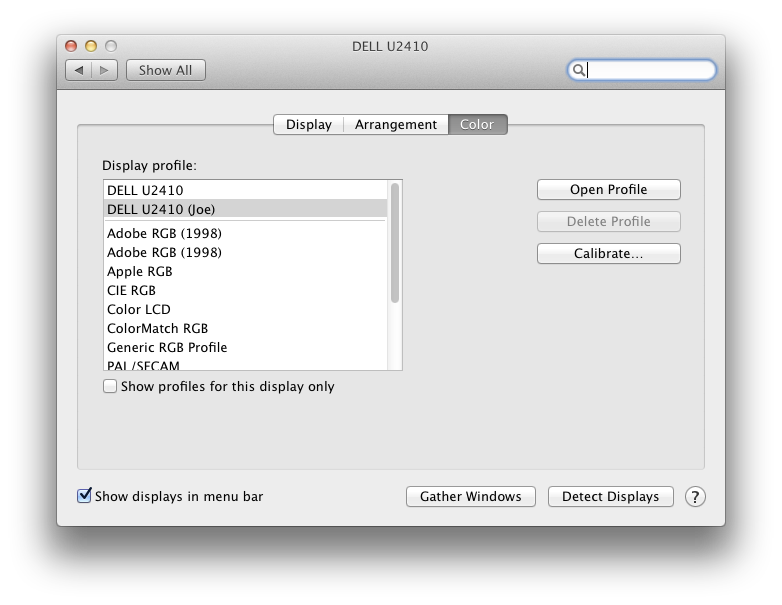 There are 7 responses to “ColorSync Profile for Dell U2410 on MacBook Pro”. Hello. Thanks for the color settings for using the Dell U2410 with a mac. The view was much better after changing the Gamma to MAC. I downloaded your Color Sync profile and moved it to the Displays folder in my library as you instructed. For some reason, when I go into Preferences\Displays\Color, it does not show your color profile in the menu. I’d really like to try it. Can you give any specific instructions on how to create my own color profile with the ColorSync utility? My main issue is that the reds are very bright and the videos are coming out very bright and fuzzy. Any help would be greatly appreciated. Thanks so much! Thanks for the settings, it looks much better. for mine I had to turn down the brightness/contrast. The reds are looking much truer. This is great — I had fiddling with the calibration tool with no success. This solves my problem and spares my frustration. I did find that my two monitors had slightly different color output (their issue, not yours), but using ‘custom colors’ on one and the Adobe RGB on the other leaves them looking nearly identical. @Will Nice:) I was so frustrated too before I made it. What really is the difference between the MAC and PC Gamma settings? Does MAC set the Gamma to Gamma 1.8 rather than 2.2, or something like that? I’m not sure really. Since I’m using MacBook, I chose Mac gamma. The color looks a bit different.